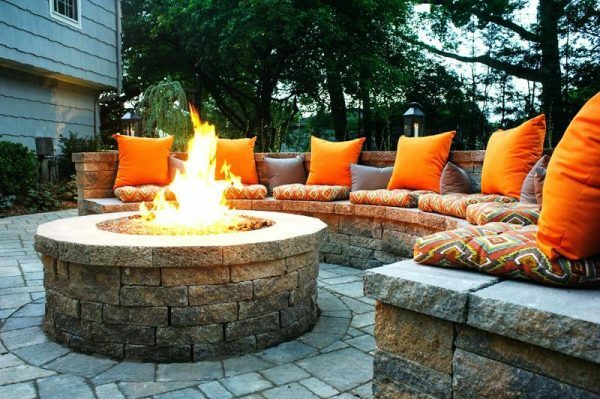 Today arrangement of landscape design using fire pits is a very popular trend. This beautiful and unusual decor element will be a wonderful complement the exterior. The existing range of models allows you to choose the one from which presence your summerhouse will become even more comfortable. To create a fire pit stone, ceramics, galvanized steel can be used. All these products are notable for high quality and practicality. Stone fire pits are considered the versatile option. Produced from natural material, they perfectly complement the landscape of any garden, no matter what style it was decorated. At the same time, the products themselves can be highly polished and rough texture, with a focus on naturalness. Bowls of ceramics are attracted by their small size and portability. Their compact size allows to place them anywhere in the gardening area. At the same time, ceramic has a special coating that increases its fire-resistant properties. Fire pits created from galvanized steel often have an interesting design. These architectural products will always look impressive and elegant. Using them is also very convenient due to its light weight. In order to increase product lifetime outdoors, they are often coated with a protective polymeric material. Almost all models have a special nozzles and additions that allow to cook food on a fire. Beautiful and practical. The variety of models allows you to choose the option that will be a nice decorative addition to any landscape. And the presence of the special borders makes the product even practical. At the fire pit you can cook dozens of dishes. The advantages of fire pits also include high safety of use. Thanks to the forethought design, the fire won’t spread freely, but will take only a space strictly reserved for it. The fire pit stands on special ‘legs’, raising its level to the ground, that is designed to avoid the risk of damage to the lawn.